Smart Agent is world's best Insurance Management Software with mobile app. It Designed with internation standards & It is used by 10,000+ customer world wide. It also help insurance agents to provide service to their customer and get more customers. Use software from destop, laptop, mobile & tablets too. Access web system from www.smartagent.co.in, It also help insurance agents to provide service to their customer and get more customers. Smart Agent is designed by most talented team with years of experiance. It has everything to make your Insurance policy business run smoothly. It also help insurance agents to provide service to their customer and get more customers. Smart Agent is fully automates and integrates policy processing for personal and commercial insurance carriers. The solution offers scalable, reliable and cost-effective business management functionalities to carry out business critical insurance process functions. SmartAgent.co.in is a cloud based software as service system. 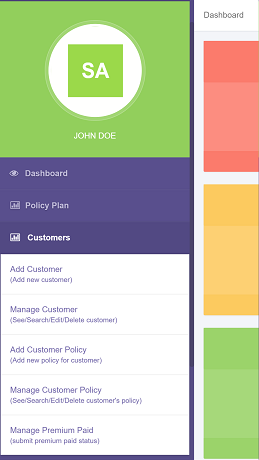 It is the only Insurance Policy Management System with extremly user friendly UI. Smart Agent Mobile Application will help Individual agent and Insuarance agencies to manage their various tedious tasks like Policy Plan, Customers Details, Customer's Policy Details, Premium Reminder, Premium Paid Status, Send SMS to Customer. We have researched the market and tried to find the software that will cater to the needs of the small and medium sized businesses, but did not find any. As of now most of the centers try to manage all their data via excel sheets and any harddisk crash is a nightmare for them. Through SmartAgent.co.in we have tried to introduce a simplest management software, keeping in mind almost all the daily needs of the agents and agencies. Smart Agentis loaded with the all the necessary features but below you can see major and important features that every agent/agency needed. Agent/Agency can check their monthly or yearly commision income. Send different type of sms alert to customers like policy renewal, birthday wish, anniversary wish, policy registered etc.